On February 25, 2010 our comadre, our beloved comadre Puji, Megdonia Payano, died in Tupe. We know little of what happened; it appears she fell near Waylluru, along the irrigation canal. It seems impossible, something that should not be. For us it is a terrible blow, and she was junior to both of us. We feel devastated, deeply shocked and in deep sorrow. She was a strong woman, so very able, and of so very many talents: member of the town council when Dimas was mayor, involved in the building of the library, an expert weaver, could sing the yarawi magnificently, set to be part of the recovery of Jaqaru in the teaching in the schools. She signed the demand to the Ministry that it be permitted that Jaqaru be taught in the schools with the materials that she had now for so many years. The papers in her hand in the photograph are from the meeting in that regard. 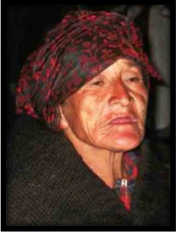 She did not live to long enough to see the Ministry fulfill its promise; she did not live to see her hopes for her beloved Jaqaru language realized. You will always be missed. You leave a profound empty space in our hearts. Dear comadre, may you rest in peace. Have we not just suffered this?